Risk Management helps you to improve patient safety and decrease your risk of a claim. We provide personalized risk management solutions through consultation and educational support with expertise in clinical patient care, hospital risk management and administrative healthcare. 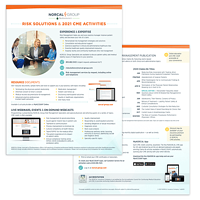 We’re equipped to provide the risk management strategies you and your practice manager/administrator need, when you need them. Contact Us. Our Risk Management Specialists are available to discuss patient safety and medical liability issues of importance to your practice. We can be reached at 855.882.3412 and risksolutions@norcal-group.com. If your situation is urgent, as a policyholder, you can rest assured that we provide 24/7 access to a Risk Management Specialist: 855.882.3412. Additional onsite risk management services are available. 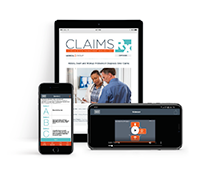 We maintain over 100 resource documents, sample forms and tools to support our policyholders. Topics include working with allied health providers, informed consent, follow up of patient care, medical records documentation and management, EHR, medication management, and many more. These documents are available to all policyholders by calling a Risk Management Specialist at 855.882.3412 and are available online to policyholders in many states. * Special topics may be available upon request.